The battle will continue. Today, Travel Channel announced they’ve ordered a second season of their Man v. Food revival. The docuseries reboot follows new host Casey Webb as he travels around the country to take on tremendous, outrageous and mind-boggling food challenges. The series formerly featured food enthusiast Adam Richman and ran for four seasons before ending in 2012. Season two of Man v. Food will premiere on Travel Channel later this year. 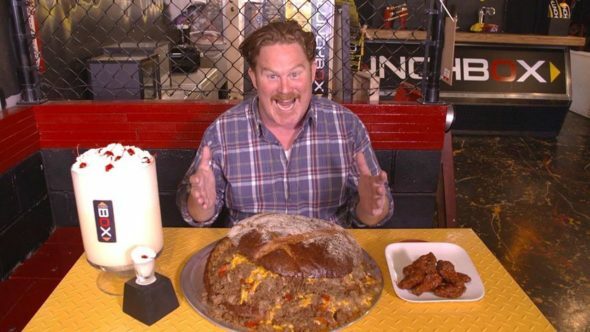 NEW YORK (August 30, 2017) – “Man v. Food” with new man Casey Webb, a restaurant business veteran with an unquenchable thirst for travel and competition, has delivered 3.5 million viewers for Travel Channel after just four weeks in its Monday 9 p.m. ET/PT timeslot – prompting the network’s mid-season greenlight of 14 episodes for season two. The series, which spotlights Webb as he travels around the country to take on tremendous, outrageous and mind-boggling food challenges, has delivered a 27 percent increase in prime ratings among P25-54 for its timeslot. The second season will premiere later this year. What do you think? Have you seen the Man v. Food revival? Are you glad it’s coming back? Casey is a dud. Feed him to the fish. Was a fan but seems like Casey Webb just talks rarely finishes a challenge. What’s the point of the show? Previous host was way more entertaining and far less obnoxious. I’ve always been a fan of MvF.